REVIEWER’S NOTE: As this review was not solicited by the publisher or author, the author was offered the right of reply – his response his reproduced below, following the review. I came across this book referenced in an online article, wherein the writers were extremely dismissive, presumably because of the title “Greater than Bradman: Celebrating Sachin – the Greatest Batsman in Cricket History”. The author Mr RL Fernandez had, quite rightly, questioned their “review”, particularly as the critics admitted to not having actually read the book. Having been on the end of that myself, I decided I would reserve judgement and duly bought my own copy. Some time ago, I completed a long and involved study of significant Test innings, in which Bradman came out top on a per-Test basis but Tendulkar came out top on an aggregate basis. Although the study was completely objective, I was persuaded by a staff colleague to put forward the accompanying feature along similar lines to this book, i.e. Tendulkar Better than Bradman. I was naturally taken to task for this by some forum members and vowed never to do the same again, given that the study was as I say totally objective but had its findings devalued by the method of presentation. The tone of the book is set quite early, with the repeated insistence that Bradman in fact played only 50 Tests, not 52 (though surely this makes Bradman’s achievements even more impressive, having been made over fewer Tests?). Additionally, Bradman is stated as having a career of only ten years, a fact which is stressed over and over – this is based on the actual calendar years in which he played Test cricket, and of course conveniently removes Bradman from any further discussion on greatness maintained through longevity. The author states that the greatest batsmen have all played in more than 130 Tests, which of course is era-dependent, and leaves out the likes of Hobbs (whose own career spanned 24 years), Hammond and Headley, not just Bradman. Additionally, that “a long career implies proven skill”, where he again restricts Bradman to ten years, rather than the actual duration of 21 years – a chart shows Bradman at the bottom of the pile of chosen batsmen with 10 years, whereas he would be ranked at number two amongst the players shown if 21 years is used. Much is also made of the fact that Bradman played most of his Test cricket against England, who the author concedes were the strongest opposition at the time. This is actually put forward as being less impressive than facing more teams of overall lower calibre. Measuring the attacks of their respective opponents, he also uses measures of greatness based on aggregates, i.e. 300 wickets, which of course will leave Bradman’s opponents looking less impressive as they played far fewer Tests. Fielders are graded using similar aggregate measures. Nonetheless, this latter point, i.e. that Bradman’s overall strength of opponent was lower than Tendulkar’s, is measurable. Some time ago I calculated the ICC Test team ratings all the way back to 1877, so it is possible to come up with an average of opponent ratings based on number of Tests played against each opponent and their rating at the time; the result shows Bradman’s average opponent rated at 99, Tendulkar’s at 108, so the author is correct in that regard, though the difference isn’t huge. There are a number of inconsistencies, such as berating Bradman for playing most of his matches against England but similarly berating him for scoring 10% of his runs against India (no mention is made that more than 11% of Tendulkar’s runs came against the correspondingly weak Zimbabwe and Bangladesh). The author makes an inappropriate comparison with Pele – “But 50 Tests?! Would Pele be accepted as one of the greatest footballers if he had succeeded in only one, instead of four World Cups?”. Quite apart from the fact that Pele was not successful in one of those World Cups (1966 in England), he is using different bases here, measuring total number of matches on the one hand against degree of success on the other – Bradman was extremely successful in the Tests in which he played. I was also confused by this use of logic – “In 1928, the same year that Bradman was taking guard in his first Test at Brisbane, Johnny Weissmuller set a world Olympics record of 58 seconds in the men’s 100m freestyle swimming championships. In 2009, someone took about 52 seconds to cover the same distance in the freestyle championships; Britta Steffen’s was a world record among women.” I presume the point here is that surpassing older records is now commonplace, though how that demeans Bradman is not clear; Bradman’s average has not been remotely approached, never mind challenged. There is a very repetitive passage in which Mr Fernandez lists Bradman’s low scores individually, one after the other in ascending order, then pointing out that Bradman scored 40 or less in 44% of his innings. No mention is made that Tendulkar did so in almost 59% of his innings, far higher than Bradman. The author makes no mention of Bradman’s incredibly high number of tons per innings; as regards double centuries, Tendulkar made six in 329 innings, while Bradman made twice that many in less than a quarter of the innings; Bradman’s rate of double centuries is thus over eight times that of Tendulkar. He also makes the rather odd statement that Bradman made more than 250 “in only 5 innings” (my emphasis); during Bradman’s career, there were eleven scores over 250 made in Test cricket, five by Bradman, two by Hammond and four others with one apiece; during Tendulkar’s career, no fewer than 46 scores of 250+ were registered, no one scoring more than four (Sehwag), and of course none of those scores were made by Tendulkar. Bradman is reduced to being a “giant among dwarfs”, these dwarfs presumably including the aforementioned Hammond, Hutton, Headley, McCabe, Weekes, etc. Hobbs is dismissed as having played in “the most placid era of 20th century cricket imaginable” – I can’t imagine anyone describing the experience of facing Jack Gregory and Ted McDonald as “placid”. The author does make a salient point in that Tendulkar scored tons on many more grounds than Bradman, but nonetheless Bradman did have success everywhere he played – only Manchester of all the grounds at which he played denied him a century. Though he didn’t tour India, no such tour was organized during his playing days so it isn’t as if he avoided playing in Asia. In any case, it’s difficult to believe Bradman wouldn’t have made hay on sub-continental wickets and possibly topped the 100-mark for his career average. Mr Fernandez even gives a name to his premise, the “99.94 error”, confidently stating that anyone declaring Bradman to be the best ever is guilty of an “error of judgement”. Presumably the voters for the Wisden “Five Cricketers of the Century” are similarly afflicted, as “bewilderingly, all 100 voted for Bradman…Sachin barely got a look in with 6 votes out of 100.” Doesn’t that tell us something? I found the choice of supporting information and statistics to be very selective. The polemic of demeaning Bradman and glorifying Tendulkar necessitates that he construct a straw man to knock down, and that is the 10-year-career Bradman. What this whole treatise seems to boil down to is that players in Bradman’s era were not as good as players of Tendulkar’s era. Yet Mr Fernandez concludes “Cricket has transformed so much since the 19th century that it is unfair to compare across generations”, though that is exactly what he is attempting in these pages. If the subtitle was not warning enough as to the book’s objectivity (or lack thereof), this statement about Tendulkar in the introduction surely is – “This book is a tribute to him”. As such, I don’t feel that it does Tendulkar’s claims as the greatest ever batsman much of a service. This book throws new light on cricket’s fascinating debate. How angrily worshippers still argue, how dismissive the high priests still are, of what they see as cricketing blasphemy. Most cricket writers ‘start out with a preposition rather than a question’ – Bradman remains the greatest. But a growing minority is coming to a different conclusion. Assessing greatness over 5-10 years is easy – averages, percentages do the trick. Bring history into the picture and context becomes key: Complexity, consistency and ferocity of field combat. Readers can ‘look inside’ here to find some of that in the first two chapters. Federer is one of the greatest tennis players because, after all that he has weathered, he dares to still enter tournaments, let alone feature in quarter-finals and semi-finals. His greatness is not founded on what he could have, would have done had he been tested in more matches, against more rivals, in more formats, on a wider range of courts. That’s the point. Enduring greatness is not bestowed on speculation. It’s not based on a “what if?” It’s based on achievement. Achievement requires context but it has to be actual (not imagined achievement). Modern-era batsmen had no ‘what if’ – what if they were tested another year, what if they were tested in another match, against another rival in another ground, against a wider range of experienced world-class bowlers and fielders. They have actually been tested and actually excelled in every Test, every one of those years. Besides, they’ve been tested simultaneously in ODIs. Someone once said, even if a tad inelegantly, “Greatness ain’t what you become. It’s what you overcome.” Sachin has been tested in 12% of all 2000+ Tests and 13% of all 3500+ ODIs in history. No batsman from any nation, from any era has been tested as intensely, as differently, as consistently. Bradman’s feats weren’t insignificant – far from it. The point is, they had a context. And one so little understood. A reviewer’s quotes (from a book) are often selective. They have to be. They’re sometimes out of context. They needn’t be. Other readers have seen these quotes just as the author intended – in context. For instance, do readers believe, as the reviewer does, that Sachin’s rivals from the most competitive era were of ‘overall lower calibre’ than those that tested Bradman? 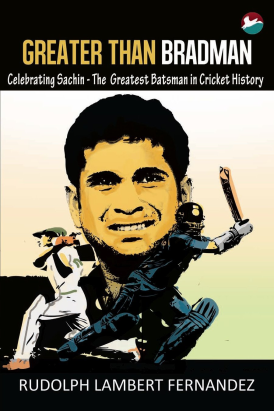 This book is a tribute not because it glorifies Sachin; over a dozen books have done that. It’s a tribute because it corrects a grave injustice. The reviewer’s first instinct some years ago (Tendulkar Better than Bradman) was right. It’s only natural that he was taken to task. Not all blasphemy is true. But as someone has said, certain truths may well start out as ‘blasphemy’. A fine dissection of a hagiography that beats them all. I think that many, not the author obviously, would struggle to put Tendulkar in the top 20 of great batsmen. Certainly not India’s greatest. A fine player, a great stayer, a wonderful diplomat, a fine man but better than Bradman (or Hutton, Sobers, Pollock, Lara, Richards, Hammond, Harvey, Gavaskar et al)? A new book from one of history's greatest fast bowlers, and now one of the most astute commentators on the game, Martin had the chance to review Michael Holding's latest effort.